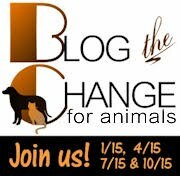 Once a quarter, the folks at Be The Change for Animals encourage bloggers to stand behind a cause. Today the focus is on puppy mills, and especially banning pet stores like Petland from selling puppies, since a large percentage of them come from puppy mills. Mary Haight from Dancing Dog Blog has started a petition to urge Petland USA to stop selling pets. Petland Canada already has. Together with the folks behind Be The Change for Animals, bloggers are rallying to spread the word so that Petland will fire the puppy mills and quit selling pets. There are plenty of great pets waiting for loving homes at rescue organizations and from responsible breeders. So today we're focusing on a sweet pup who was rescued from a puppy mill by the folks at Havanese Rescue. Hallie is about 6 years old and is a sturdy 14 pound Hav-mix. She was rescued from a puppy mill in March of 2011 and has lived with her foster mom since April. Mostly red in color with silver tips on her ears, she is a very pretty girl who grows prettier as her hair grows longer. Hallie has a mellow and submissive personality with no need to be an alpha dog. She gets along well with other dogs. She is shy and a bit skittish and will need some one-on-one attention and training to get her completely over her fear of humans and normal household activities, such as visitors and cleaning. Although she runs away when approached, she is very curious. And when she is picked up, even seems to enjoy being petted and held. She likes to be within close proximity of her human where she can keep her eyes on what is going on in the house. She is such a sweetie and she deserves a great home. A donation will be requested to adopt this dog. A completed application is required if you are interested in adoption. Havanese Rescue Inc. (HRI) is a 501(c)(3) non-profit organization formed for the charitable purposes of rescuing purebred Havanese and Havanese mixes which are homeless or soon-to-be-homeless, including those found in animal shelters or other facilities. The rescue dogs are fostered and receive the necessary medical attention and care before they are carefully placed in their forever homes. 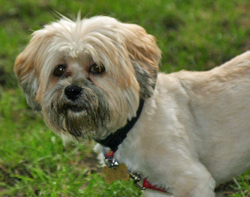 HRI also focuses on educating the public regarding puppy mills and responsible dog ownership including spay/neutering, training and humane care of Havanese and other pets. Check out some more blog posts from Blog the Change Day. Great post. What a little cutie. She deserves the very best home to make up for the horrors she has lived. I know she'll find it. Well look at that! A Havanese available for adoption in my home state! I hope she finds a great home. It takes work to rehab a puppy mill dog, but so very worth it. Thank you so much to you and Cosmo for joining Blog the Change. This is an issue near and dear to my heart, so it really touches me that so many people have chosen to blog about this topic. What a wonderful organization! This is exactly the kind of option available to people who would like a certain breed or breed mix - no need to patronize a store selling puppies from a horrible mill at all. Kudos to Havanese Rescue for all the terrific work they do on behalf of the animals. Wishing Hallie her own forever home and a bright future!